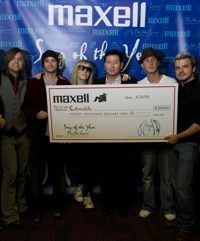 Natasha Bedingfield presents the grand prize of $20,000 to Colourslide who won the John Lennon Songwriting Contest's coveted Maxell Song of the Year. Pictured (L to R): Colourslide members and winning writers Dean Newman, Alex Lawhon, Sony recording artist Natasha Bedingfield, President of Maxell Corporation of America Hideaki Numoto, Colourslide members Steve Julian, Joe Palmer. The Gainesville, Florida band Colourslide’s musical journey is already turning heads after only one year together. Colourslide has quickly been gaining attention in the indie alternative rock scene and beyond with their self-titled debut album that was released in the first quarter of 2008. Two of the four band members, Dean Newman and Alex Lawhon, are responsible for “Wake Up Call,” the song that won the group the $20,000 Maxell Song of the Year top prize in the John Lennon Songwriting Contest. Since its release, Colourslide's album has gained a considerable amount of attention. It was on Awarestore.com's Top 5 for four consecutive weeks (where it hit #1). AlternativeAddiction.com recently selected Colourslide as the top unsigned band this year. One of the biggest highlights is the album's track "Suddenly Everything" being featured on ESPN 2's NASCAR Now for 17 weeks from August through November. "Wake Up Call" and "Resurrections Day" were also being featured on the network, during Baseball Tonight this year. All in their mid-twenties, members Dean Newman (guitar), Joe Palmer (bass) and Steve Julian (drums) had successfully formed a band by the name of Time, but after five years they found themselves without a lead singer. Per suggestion of a mutual friend, Alex Lawhon (previously of North Carolina based bands Revelation Darling and later Melbourne) auditioned and rounded out the band. "We wouldn't have been able to release the album without the talented people that we worked with." Those people include producer Ted Comerford (Army of Me, Alternate Routes), engineer Matt Boswell and mixers Ken Andrews (Pete Yorn, Mae), Mark Trombino (Jimmy Eat World, Blink 182), Mike Plotnikoff (INXS, All American Rejects, My Chemical Romance) and Paul David Hager (Goo Goo Dolls, Jesse Malin, Avril Lavigne). Lawhon not only lends his soothing melodic vocals to Colourslide but also a few of his personal songs. Five of the twelve songs on the album were previously written by Lawhon and were recreated with a Colourslide slant. The album excels track-by-track, giving the listener a mixture of addicting beats and stimulating lyrics. Their live show is touted as being even more impressive than their recording. Check out the band's tour schedule on their website, www.colourslide.com.